It’s been a beautiful day. The mist burned away by 9 o-clock, and since then the sun has been beaming down on upon us from a perfectly blue sky such as children would paint. It has been a day for being out in the garden, which means that once the sun goes down, and the children have too, I will be condemned to hours on the computer to finish my work, but it will have been worth it. I can’t claim to have done much actual gardening. This is partly because most of the garden is still a mud-pit, which is not really conducive to getting much done. I can’t mow, or dig, and in many places I shouldn’t even walk. Ladders aren’t terribly safe because the ground gives so much, but there are low level jobs. There are always jobs! Grasses have had last year’s inflorescences cut down, the paulownia tomentosa has been coppiced so that I will get those wonderful 2 foot wide leaves again this year, and the top growth of cardoons and phlomis fruticosa that has given a bit of interest and height through the winter months has now been cleared away. But in the main, I have been simply looking. There is so much to see. Leaf buds, fat and thin, are now on the climbing hydrangeas, the maples and the beech, pregnant with the promise of the stunning array of greens that will appear in a few weeks’ time. 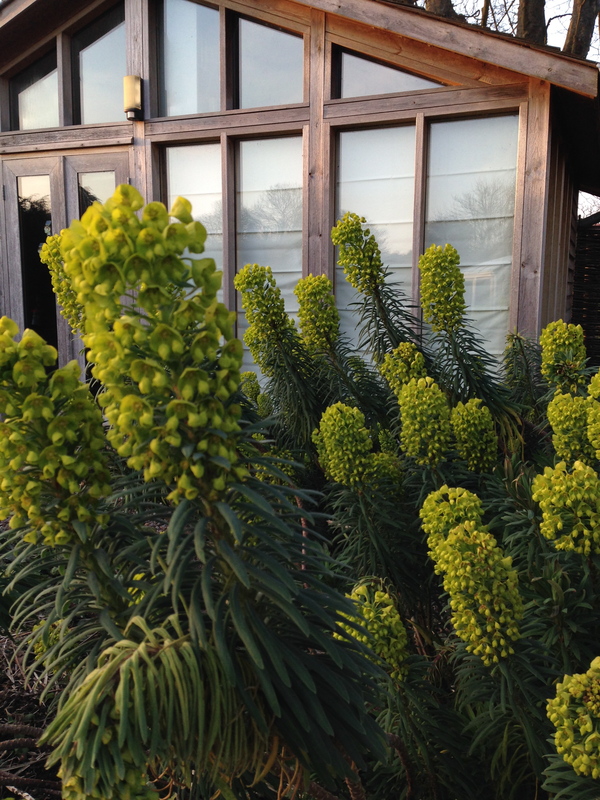 Meanwhile we have the glorious chartreuse of the euphorbias. They are slowly unfurling; their previously bowed heads now proud and upright. 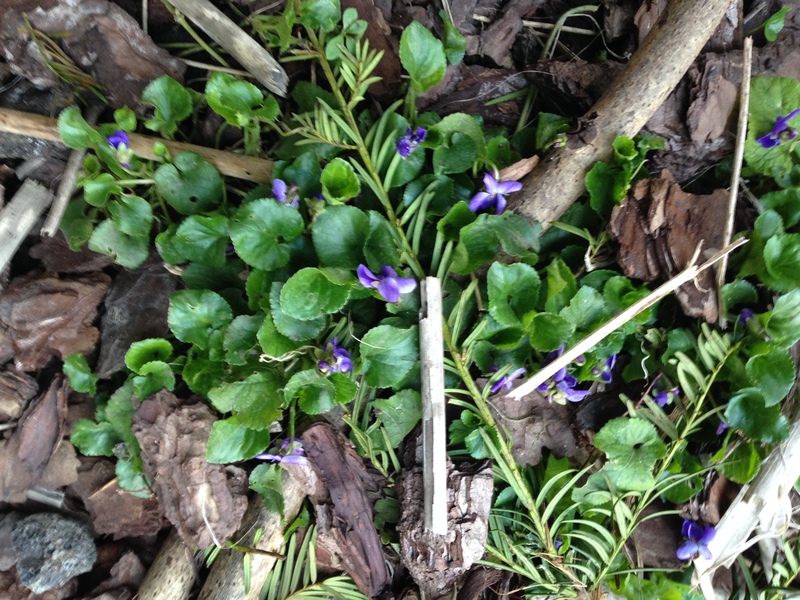 There are little purple scented violets here and there, with seemingly little preference for sun or shade, whatever the books may say. The turn up wherever they feel like it, and they always make me smile. (Which won’t stop me pulling out the ones that risk suffocating my perennials, but they will find a new home in the rough lawn.) 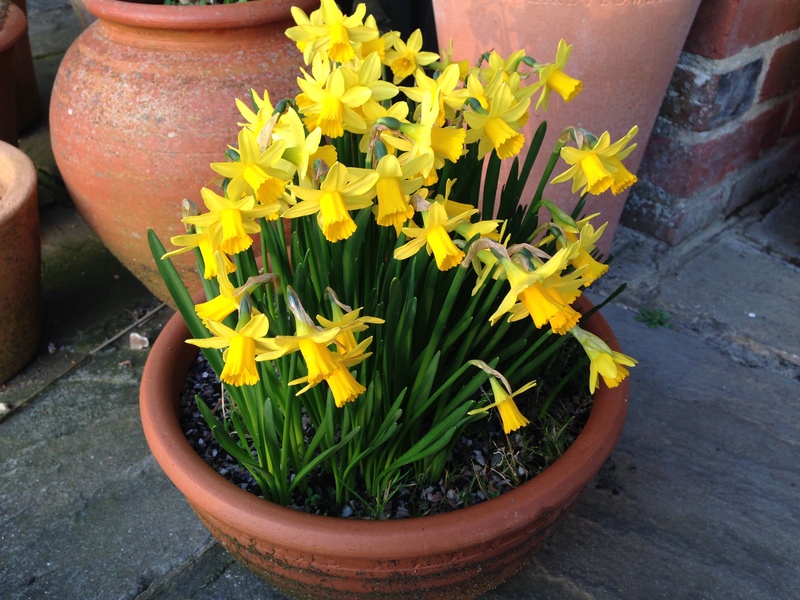 Right by the kitchen door, where we benefit from their pick-me-up effect several times a day, are the little bowls of narcissi, finally fully out. They make a cheering puddle of golden sunshine even on a dull day. On a day like today they are radiant. Best of all are the first brimstone butterflies. They flit amongst the euphorbias and the grasses, a perfect delicate paper-thin form of true yellow. They are my favourite butterfly, in part because they are the first to visit us every year. It has been a good, sunshine day.